Would love to win! Thanks for your generosity! Have been a fan for a long time. Thanks for the chances. What a blessing this would be to win. My little boy would love this!! Hope I win! What a fun gift card. I like and totally love target. Would love to win!!! I need something good to happen!!! So cute! My nephew loves creepy crawlies and would love this! My son would love this! Thanks for the opportunity!! My grandson would love this one. My two year old is all about the creepy crawly things, so cute, thanks for the giveaway. Just liked your facebook page for the first time. Excited to save!! this is a fabulous website! I could really use this!! Thanks for all you do! 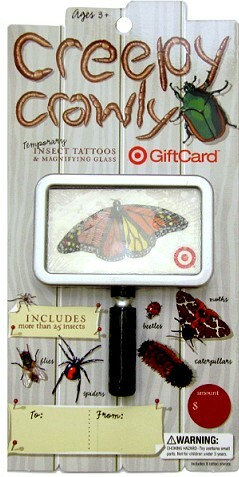 I like the bonus magnifying glass and insect tats. Thank you, TT, for helping me save money. I need all the help I can get. I’m liking you on FB, too. I love butterflies……and I love ur site.